So I had a rough 2014 and a really rough 2015, so I’ve been making some changes in 2016. Some are small changes and some are more substantial, but all are positive, and I feel better and stronger now (only six weeks into the year) than I have in a long time. I don’t intend to spend a lot of time looking backward, but every once in a while I might talk about something that’s made a difference for me. I work on my couch, with all the stuff I need to do said work on my coffee table. I have a den/office area with a desk and an iMac, but I don’t like the chair. And my Macbook is set up just for me. And, to be perfectly honest, my dogs hate it. They’re my sidekicks, hanging out with me on the couch while I write. If I sit at the desk, they sit on the hard, cold wood floor and stare at me mournfully. Trust me, it’s very sad. I remember years ago, doing a New Year’s resolution about finding more separation between work and personal time. It’s exceptionally hard to segue from work day to personal time when you work from home. And when your couch is literally your workplace and your relaxation spot, it’s very hard. The obvious fix: work at the damn desk. But one of the most important things about my 2016 changes is not going with the obvious fix, but going with the fix that I believe best works for me and that I can actually implement on a daily basis without stress. I’m simply not going to work at the desk. I’m going to write with my laptop, curled up on the couch with my dogs. So a smaller change. Probably also obvious, but one that’s more about breaking a years-long habit than simplicity. A dedicated space in the office where, at the end of the work day, the laptop and assorted writing debris go to hide. 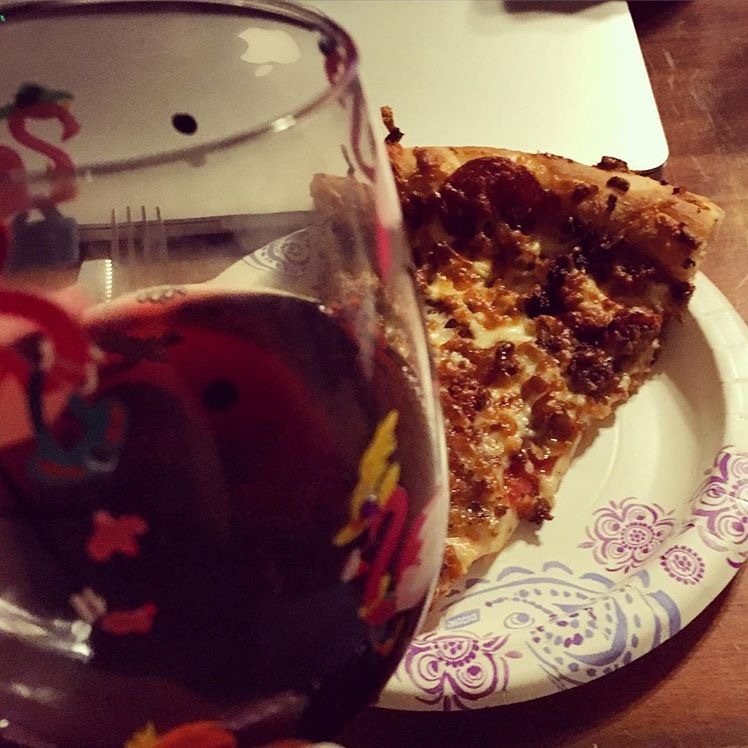 This photo had a caption of “Red with meatlover’s pizza, right?” and amused me. But you can see my laptop lurking there in the background. 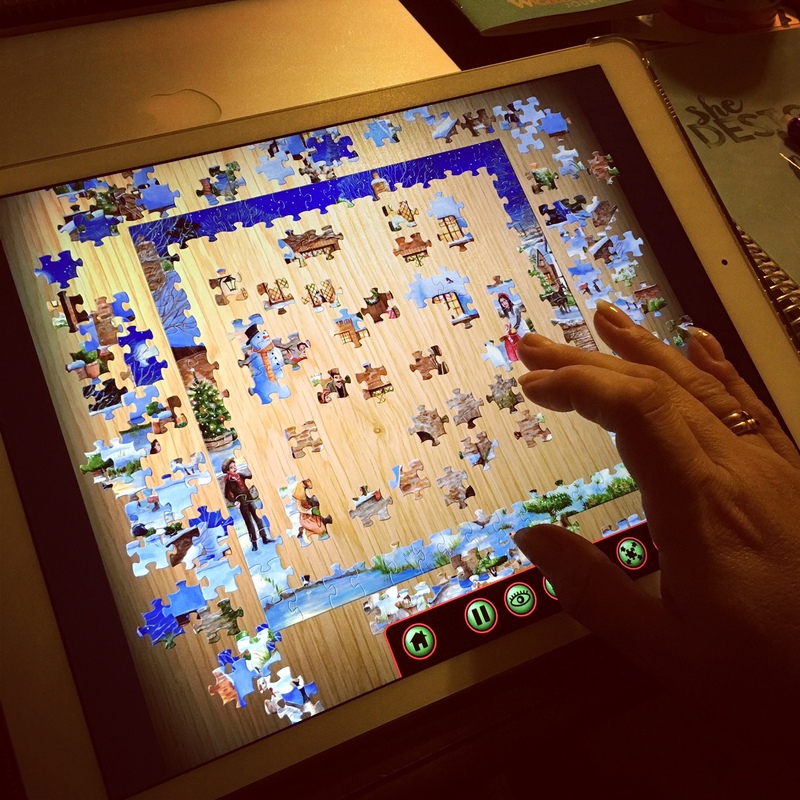 Relaxing with a jigsaw puzzle. (Digitally on the iPad because my cats are real jerks. Of all the available apps, the only one I’ve liked—and I love it—is Jigsaw Puzzle Pro by Critical Hit Software.) And there’s the ever-present Macbook, taunting me with the fact I should be working even though it was after eight and we were watching NCIS. When you’re overloaded with work (or even when you’re not) it can be hard to relax when that work is staring at you from two feet away. I still have my phone. I can play on the iPad. And I’ve started reading on my Kindle Voyage again to cut down on the distractions and really immerse myself in the books I’m reading. But the “work” goes away at the end of the day. This entry was posted on Monday, February 15th, 2016 at 9:16 am in Uncategorized. You can feed this entry. Both comments and pings are currently closed. Finding solutions that work for you, even if others disagree, is the only thing that truly works long term. So good for you! Definitely! Even the most common sense of solutions won’t work if it doesn’t fit my life and the wacky way I do things. Well, what you are doing seems to work, So why do you want to fix something that’s not broken… Love your books! !